This model was fun to paint. I tried some new things on it. I painted fishnet stockings. I also worked hard tog et the blue how I wanted it. With the turquoise it's easy to get the highlights and shadows too stark. I'm pleased with how they turned out on this model. I've been feeling a bit like blogging is on the decline in the wargaming world. 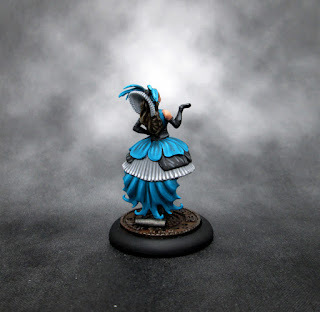 As I've been painting more Malifaux there doesn't seem to be much of a Malifaux blogging community that posts and communicates through blogs. I'm going to keep posting finished models here but the frequency might decrease a bit. As always, thanks for visiting. 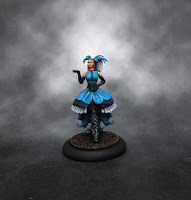 I have lots of other painted models just waiting to be posted up. For more regular updates, you can follow me on twitter (see the little box at the top right). Sorry about the previous replies that got caught in the spam filter. I've added them and commented on them now! Beautifully done, man - that looks awesome! Haha, thanks. She's pretty petite. Seems big compared to 15mm though. I get what you're saying about blogging. Right now, it seems that Facebook groups are getting all the love. I can recall when forums were the big thing, then blogging, and now people just seem to want quick little blurbs to go with tiny little pics on their phones. Yeah, the way people communicate is constantly evolving. I like the permanence of a blog and a chance to build a sort of relationship with readers. Things are changing though. Facebook is so convenient and offers the same chance to connect. Things like our van miniature painters group is a great way to build community. Yeah. I'm only eight years or so into this newfangled 'blogging' thing, but it's evidently starting to decline. It's a pity, but it seems inevitable. I so like the sense of relative 'permanence' that the blog affords. As I started off in '08 anticipating no-one ever looking at my blog, it's been a surprise and a delight to discover a now-waning community, but I've got an awful lot from it - including some marvellous real-world friends - and even if the traffic slows to a halt, I like the blog as just a record of my hobby and a point of reference. Why, only last week I found myself using my own painting guide as a reminder of my process! Oh, lovely miniature too, mate: gorgeous! Good point on the "permanence" thing. 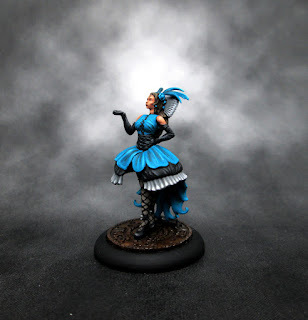 Even if you blog just for self-gratification (uh... that sounded better in my head than in print), it's a great record of what you've done before, and a good way to chronicle your progress and growth as a painter. Facebook, on the other hand, is as fleeting as a sandcastle on a beach. The eventual tide of other posts is just going to wash it all away, so why even bother coming up with a well written post? Hence, the short blurbs and dumbed-down broken sentences. Great for getting a point across at that very moment, but nothing that anyone can easily reference later if they want. Drax, I find the same. 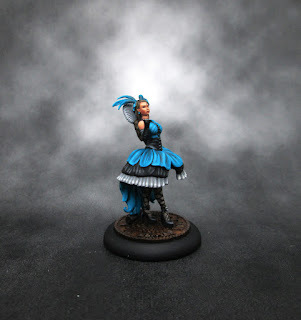 I often come back to my blog to look at how I painted something in the past. Facebook is very fleeting. I guess I could set up a page there, but it doesn't interest ne too much. I'll keep posting here, but it might be shorter posts and a bit less frequently.